StageBuzz.com: Planet Connections Interview - Christopher Leidenfrost of "The Greatest Pirate Story (N)Ever Told!" 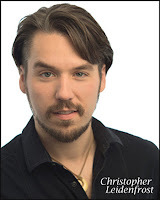 Planet Connections Interview - Christopher Leidenfrost of "The Greatest Pirate Story (N)Ever Told!" Show: The Greatest Pirate Story (N)Ever Told! I took a community school theatre class at age 8 instructed by the venerable Ms. Fritze. I had such a great time, and met my best childhood friend. We started putting on shows in our backyards for our parents and making short films with the family camcorder... and I basically just haven't stopped. Everything and everyone... I feel that every show- bad or good- helps influence my work as a director, writer and performer. If I had to pick a few performer favorites, I'd say Meryl Streep, Angela Lansbury, Maggie Smith, Michael Gambon, Ian McKellan and Johnny Depp. "Greatest Pirate Story" is about a rag-tag crew of pirates who are sent into the future by a sea witch to put on a show and to prove their worth. (Why? Treasure, of course!) The pirates then spin a story out of suggestions given to them by the audience-- so it's never the same show twice! I've always loved the romanticized idea of pirates, and have worked in the genre as an event producer for almost a decade. During that time, I was also working as an improv performer, and the notion to really marry the two gave birth to this show. We are supporting the RESCU Foundation, a non-profit organization established to promote and maintain the health and medical well-being of the participants of Renaissance Faires, historical performances and other artistic events through financial assistance, advocacy, education and preventative programs. 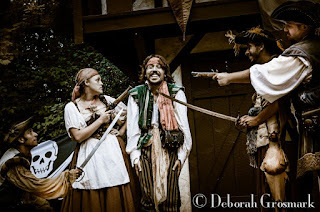 Because the show was developed at both the "New York Renaissance Faire" and Historic Hudson Valley's "Pirates of the Hudson" festival, it was a perfect fit. It's also a community I'm proud to be a part of and so glad to have a chance to give back to. 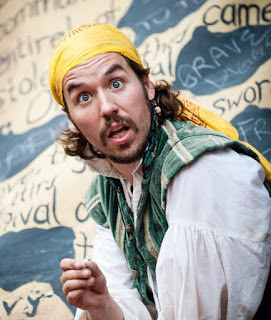 We are touring with "Greatest Pirate Story" through September, first to Provincetown, MA, and then back to the New York Renaissance Faire in Tuxedo Park, NY. Angela Lansbury!! No question. I loved her as a child... she was hands down my favorite performer from "Bedknobs and Broomsticks" to "Sweeney Todd" to "Murder, She Wrote!" I loved them all, and have always dreamed of getting to work with her.